This recipe for Pan-Seared Salmon with Arugula, Beets and Horseradish and Sour Cream is a totally delicious way to prepare your fresh salmon from Passanante’s Home Food Service. Complete with little-known candy stripe beets, this meal offers a clean, earthy and rich take on everyone’s favorite fresh water fish. 1. Wash and dry all fresh produce. Remove salmon from refrigerator and allow to sit and warm to room temperature. 2. Boil the beets for 20-22 minutes or until tender when pierced with a fork. Drain and set aside until cool enough to touch. Using a paper towel gently rub the skin off each beet before thinly slicing the beets into rounds. 3. Cut off and discard the stem ends of the brussels sprouts and cut each sprout in half length wise and continue to thinly slice. 4. Peel and finely grate the horseradish. In a small bowl whisk together horseradish and sour cream; season with salt and pepper. 5. Peel and mince the shallot to get 2 tablespoons of minced shallot; place in a small bowl with the sherry vinegar. Finely chop the chives. 6. Add farro to a medium pot of boiling water and cook 16-18 minutes or until tender. Drain thoroughly and return to the pot. Add the arugula and a drizzle of olive oil. Toss gently and season with salt and pepper. 7. Season the salmon fillets with salt and pepper and in a medium nonstick pan heat 2 teaspoons of olive oil on medium-high until hot. Add the seasoned fillets. Cook for 2-3 minutes per side. 8. Combine brussels sprouts, shallot-vinegar mixture , chives and slices beets. Add a drizzle of olive oil and salt and pepper. Top the salmon with the salad and a garnish of horseradish sour cream. 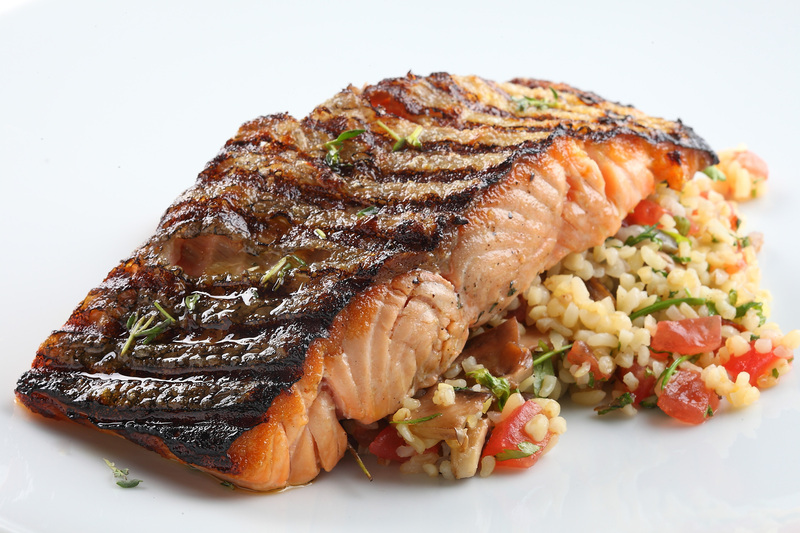 This entry was posted in Recipes, Seafood and tagged Pan-Seared Salmon, Passanante's Home Food Service, Recipe by Passanante's Home Food Service. Bookmark the permalink.